Last edited by MyLOTUSGarage.com; 07-25-2013 at 05:27 AM. Are you sure it's Emissions legal in all 50 states? I'm in California, and when I looked the Intake up from the K&N website (57A-6034 - K&N Intake Kits, Performance Intake Kit direct from K&N, it says it's not legal in all 50 states. This intake system is legal for street use in most states. However, it is not legal for street use in California and any states that have adopted California Emissions Standards under Section 177 of the Federal Clean Air Act of 1970. Intake systems are subject to governmental regulation in California and certain other states adopting the emission standards of the California Air Resources Board. In order for an intake system to be legal on a specific vehicle in California and the other adopting states, the part number must receive a CARB Executive Order (EO) number. This number makes the part legal for use only on specific years, makes and models of vehicles. A decal with CARB EO number for these parts must be displayed in the engine bay to satisfy smog inspection requirements. All K&N 57 series intakes for North American vehicles have received CARB EO numbers and are street legal in all 50 states. just one of the many reasons to love CA. Frankly I don't see how the CA guys make it. Will this work on my 2009 Elise? Will this take me to the moon? 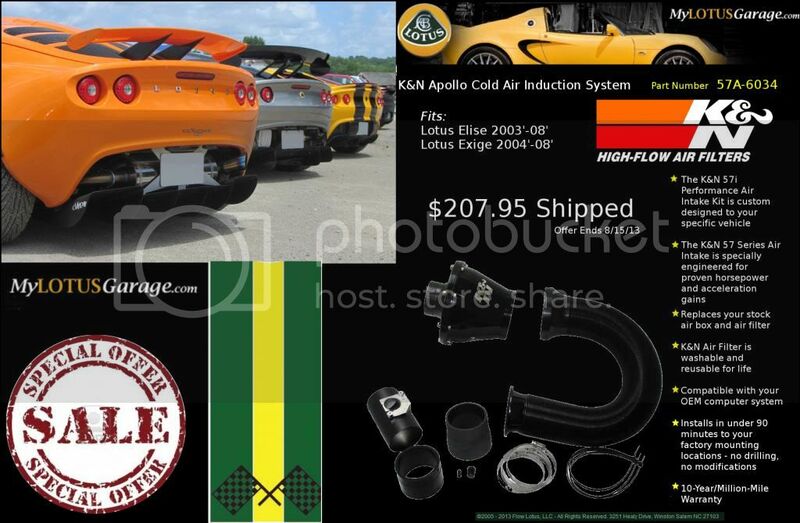 Fits all Toyota 2ZZ powered Lotus models from model year 2005 on.